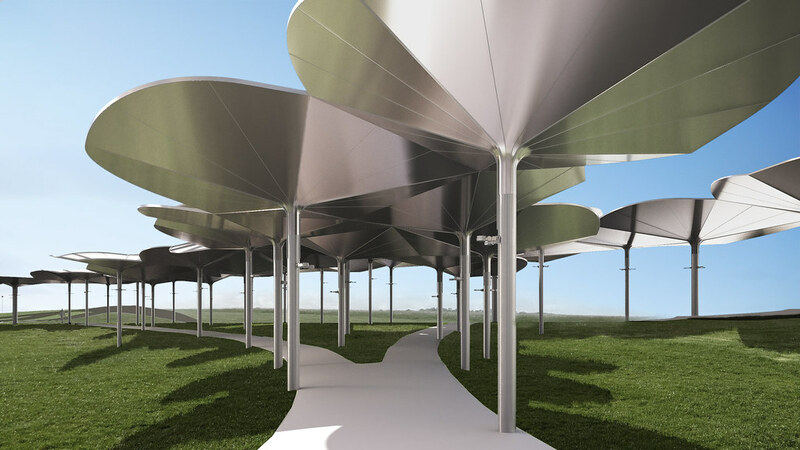 A modular system of “Flowers”, inspired by the flowers of Gabon, form a continuous canopy to provide shelter from the rain, shade during the day, and lighting at night. These Flowers bridge between the Conference Center and the Palais des Arts. Structurally, the flowers are conceived as five single form rolled stainless steel sheets, or “petals”; that funnel rain water into the “stem”, a stainless steel column. Each flower is structurally dependent on its neighbors which are grouped using a Cairo Tile pattern in order to mimic the indigenous pentagonal flowers of Gabon.